Troy Brouwer, a native of North Delta, attended school in North Delta and grew up playing his youth hockey with the North Delta Minor Hockey Association. Troy spent his major junior hockey career of five seasons in the Western Hockey League with the Moose Jaw Warriors. In his final year with the Warriors in 2005-2006, he was named team captain and registered a team-high 49 goals and 53 assists. Brouwer’s 102 points also led the WHL, leading to his being awarded the Bob Clarke Trophy in 2006. Troy was drafted 214th overall in the 2004 NHL Entry Draft by the Chicago Blackhawks. Troy Brouwer was assigned to the Norfolk Admirals, the Blackhawks’ American Hockey League affiliate in 2006-2007, where he recorded 79 points and was named to the AHL All-Rookie and Second All-Star Teams. He also made his NHL debut that season, playing 10 games with the Blackhawks. As a Blackhawk, Troy joined three of his previous minor hockey team mates, Colin Fraser, Brent Seabrook and Andrew Ladd from his Vancouver summer team, the Pacific Vipers. In the 2007-2008 season, Brouwer was again in the American Hockey League with the Rockford IceHogs, Chicago’s newly assigned AHL affiliate. Although his production dipped to 54 points in 75 games, he scored a franchise-record 25 powerplay goals, just two short of the AHL record. Recalled by the Blackhawks for short stint at the end of the season, Troy registered his first NHL point and an assist on March 23, 2008 against the St Louis Blues. From 2008 to the present, Troy has been a consistent force for the Chicago Blackhawks. Winning the Stanley Cup in 2010, he recorded 22 goals and 18 assists in the regular season. In the playoffs, he played 19 games while scoring 4 goals and assisting 4 times. 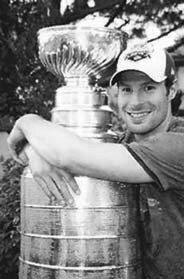 On July 15, 2010 Troy Brouwer brought the Stanley Cup home to North Delta where thousands lined the streets in honour of the hometown boy. It was a great culmination of incredible athletic determination, discipline and exemplary love of sport by Troy. The day was very moving for the community of North Delta and indeed for all his family and friends. It was particularly significant for Coach John Batchelor, who did much to guide his growth and development as a hockey player. The Delta Sports Hall of Fame trusts that his choice as Male Professional Athlete of the Year will be an inspiration for all athletes throughout Delta to play harder and smarter. It is also a “dream come true” in North Delta; one of their own not only made the NHL, but also brought home the Stanley Cup.